Mozart -- 14 of His Easiest Piano Pieces composed by Wolfgang Amadeus Mozart (1756-1791). Edited by Willard A. Palmer. For Piano. Masterworks; Piano Collection. Alfred Masterwork Edition. Classical; Masterwork. Early Intermediate; Intermediate; Late Intermediate. Book. 32 pages. Published by Alfred Music (AP.384).ISBN 0739014056. 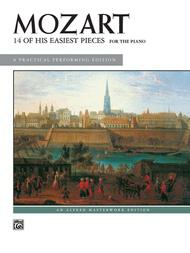 Classical; Masterwork.This collection provides an excellent introduction to Mozart's easiest works. Selections include short dances such as the popular "Minuet in F Major," easier sonata movements and arrangements of familiar opera arias. The short biography and notes on each piece will be appreciated by students new to the study of Mozart's music.